Designers from one of the North Caucasus republics, who have been designing ready-to-wear collections that incorporate elements of the national Karachay-Cherkess dress for several years, have created their own interpretation of the ethnic-inspired trends that are currently so popular. The Karachay-Cherkess Republic, like the other mountainous regions on Russia’s southern border, has a rich culture that manifests itself among other things in a bright and stylish traditional dress. And now localfashion designers have turned to this national heritage for inspiration. Among their recent creations are stylized Circassian gray felt jackets with black welts and scarlet embroidered lining, to be worn over a scarlet mini-dress with lush tulle hems or in addition to narrow red trousers. The Circassian coat (commonly referred to as the cherkeska and known as the chepken among the Karachays) is a staple of the Caucasus. Aside from appealing to nearby peoples due to its form and practicality, it also became part of the traditional Cossack costume. It is a robe-type upper garment with slightly flaring flaps that sits snugly on the upper part of the body, is tightly fastened with a belt, and is decorated with gazirnitsy (small pockets with room for gunpowder) across the chest area. The absence of a collar, a deep neckline, and a clearly defined waistline highlight the natural triangular structure of the male shape and make the person who is wearing it appear taller. The free-flowing thick skirt makes the wearer's gait appear more graceful. The cherkeska was usually worn over a beshmet, which is a long tunic-type shirt with a tightly fastened closed collar. It was sewn from a thick material, most often from home-made woolen cloth for everyday wear and from manufactured materials (satin, for example) for special occasions. The Karachay-CherkessRepublic is home to four indigenous peoples: Karachays, Cherkess, Abazins, and Nogais. It was customary to use pad stitches on the beshmet in order to create more firmness. “Older generations still wear the padded beshmets in muted dark colors that are usually made from home-made wool,” writes historian and art critic Anna Kuznetsova in her book The Folk Art of the Karachays and Balkars. The trousers in this ensemble had a complex cut, as they had to perform two functions at once. On the one hand, they had to serve a purely utilitarian function – be comfortable for walking and riding – and therefore had very loose legs that were pulled together at the waist with a strap. At the same time, they had to be consistent with the overall shapely silhouette of the outfit, which is why the lower part of the trouser leg was quite tight around the leg. The color scheme of the Karachay and Balkar men's costume was distinctly subdued, almost monochromatic. One of its main advantages, which became an aesthetic norm, was the precision of the cut and the natural proportions of the human figure. Due to the harsh climate and mountain terrain, tall, soft boots – so-called “Caucasian boots” – were a common type of footwear. According to Kuznetsova, “The elasticity of the leather shoe was made possible by its special manufacturing method. Thin leather was stitched together in the shape of a sock and pulled over a bare foot before it had a chance to dry. After drying in this position, it retained the shape of the foot for a long time. The women’s traditional costume was not much different from the men’s costume in terms of style. The same grandiose and well fitted cherkeska was slightly longer and had slightly more volume on the bottom. An undershirt, usually red or orange, similar to the men’s beshmet, was worn underneath the cherkeska. The undershirt peeked out from underneath the deep neckline of the cherkeskadress, which started at the waist. After a girl officially matured, she was supposed to wear a short caftan that was similar in cut to the men’s beshmet. It was fastened across the chest with a large number (up to 20) of big silver clasps (in Karachay-Cherkessia, silver was considered more valuable than gold) and decorated with lacing and embroidery. The hem was visible from underneath the deep but modest cut of the dress. Perhaps the only major difference was in the headwear. Whereas men, especially bythe 19th century, preferred wool and fur hats that were variants of the traditional cylinder-shaped hats with a flat top, women’s hats and scarves were marked by a more elaborate décor. The Nogai wedding hats were up to 70 centimeters tall and embroidered with gold, silver, fur, and jewels, and were worth the price of several horses. And, of course, women would not be women without accessories. The women of the Caucasus love accessories and wear a lot of them. The main highlight of the traditional dress is the silver belt called the kyumyush beli bau, which was especially popular among Karachay women. These days, the traditional Karachay-Cherkess dress is a popular image among clothing designers. Over the past few years, local designers have released several modern clothing collections based on the traditional cherkeska and beshmet. Elaborately embroidered and decorated wedding dresses with national undertones are especially popular among women who live in the republic. Of course, it is a bit strange to see a person wearing a traditional costume on the street. “Black items decorated with rhinestones and long skirts that were, for the most part, green last year are the most popular when it comes to everyday wear,” says Cherkessia resident Viktoria. “A lot of Muslim women wear the hijab, which historically is not a part of Karachay culture. During the summer, you can spot the combination of a hijab, floor-length skirt, long-sleeved shirt (sometimes the color schemes are so bright it’s almost blinding), and sunglasses that cover half of the woman’s face. It’s a similar story with the men. Their favorite item is red moccasins,” she says. But modern avant-garde and artists have already taken up the idea of introducing elements of the national costume into everyday wear. Members of the creative elite often wear a jacket that resembles a shortened cherkeska with stylized gazirnitsy. 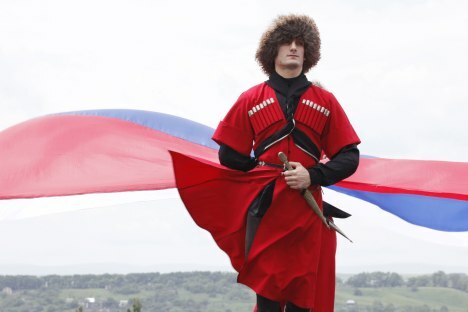 Perhaps in the near future, it won’t be unusual to see a long red beshmet combined with a thin flesh-colored belt, a navy Zara jacket, and flesh-colored Bagglerina or Bloch ballet flats on the streets of Karachay-Cherkessia.